Matt Rodin plays Ace Baker in the musical "Beau," slated for the Adirondack Theater Festival this summer. Producers are looking to take "Beau" from its ATF run to New York City stages. 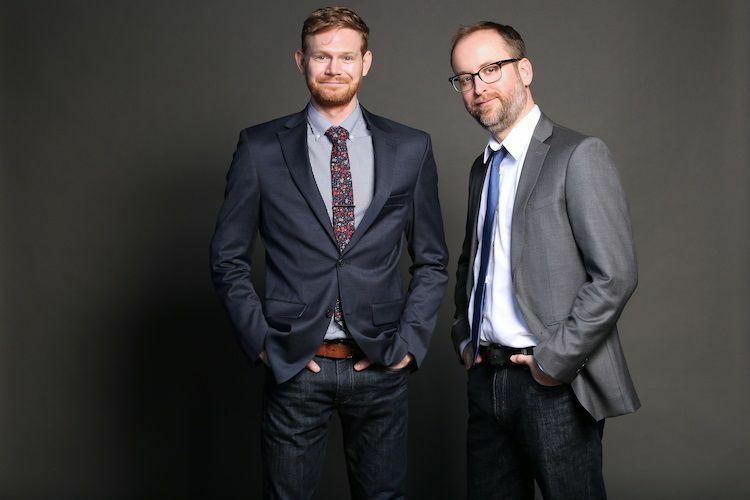 Known in the musical theater world as Kooman and Dimond, Michael Kooman and Chris Dimond are the artists behind "The Enlightenment of Percival von Schmootz." This Monty Python-ish musical comedy plays during this summer's Adirondack Theater Festival. GLENS FALLS — Often, playwrights follow a long creative route to get to a more complete work. Playing to audiences in the early developmental stages, they tweak, they rewrite, they add to or create new musical scores and sometimes the changes happen just hours before curtain call. And it is from early audience feedback that original works come forth, much like the new plays headlining this summer’s Adirondack Theatre Festival’s 25th anniversary season. “They are years in the making,” said ATF Producing Artistic Director Chad Rabinovitz, pointing to “Calling all Kates,” the play that opens this summer’s season. This romantic comedy musical is based on the true story about a young man (Marc) who plans a honeymoon around the world only to have his fiancé break up with him, leaving him with non-transferable and non-refundable plane tickets. Marc does a social media search to find someone with the exact same name as his ex to travel the globe with him. "The Enlightenment of Percival von Schmootz," by the celebrated comedic songwriting duo, Michael Kooman & Chris Dimond. Directed by Scott Weinstein ("Knights of the Sales Office,") this Monty Python-esque musical follows a ridiculously optimistic young man fed up with a world filled with plagues, pestilence and poor personal hygiene as he sets out on a quest to end the Dark Ages. "Sequence," by Canadian playwright Arun Lakra and directed by Marshall Pailet ("Loch Ness" and "Nikola Tesla Drops the Beat.") An edge-of-your-seat science thriller follows Time Magazine’s “Luckiest Man Alive” who has successfully bet double or nothing on the Super Bowl coin toss for 20 consecutive years. He’s getting ready to risk $800 million on the 21st when a young woman claims to have figured out his mathematical secret. "Beau," by Douglas Lyons & Ethan D. Pakchar. Eight actor-musicians tell the story of Ace Baker, who spends the first decade of his life fatherless. At 12 years old, a phone call reveals that his grandfather, Beau, has been alive all his life … and his mother knew. Family secrets unravel as Ace rushes to make up for lost time with a man who changes his life and puts a guitar in his hand. Beau is presented by special arrangement with R.K. Greene, The StoryLine Project, LLC. Adirondack Theatre Festival brings back the PB&J Café: A Dinner Theatre for Kids. This year’s production is the classic adventure, "Alice in Wonderland" by Lewis Carroll and adapted by Kathryn Schultz Miller, performing June 25-28 & July 16-20. Additional special events for the 2019 Season feature "ATF’s Greatest Hits,"a collection of fan-favorite songs from ATF musicals over the past 25 years, July 7-8. A concert reading of a new musical, "Start Again," from the writer of ATF’s best-selling show, "Nikola Tesla Drops the Beat,"July 19-20. And an utterly unique blend of comedy, magic, and contortion with Jonathan Burns: Flexible Comedy, June 28 & 29. Dedicated to new plays and musicals, ATF’s 2019 season comes on the heels of a record-breaking, sometimes sold-out, 2018 season that saw both doubled attendance and subscribers. The new season, celebrating ATF’s 25 years in Glens Falls, runs June 14 through Aug. 9 at the Charles R. Wood Theater, featuring four main stage shows and four special events. Kicking off the summer, “Calling all Kates,” directed by Rabinovitz, is rooted in a true story. Rabinovitz first had the idea after hearing about the actual story of a 28-year-old Toronto man who offered free round-the-world air tickets on Reddit, a social media site, to any woman named Elizabeth Gallagher, the name the tickets were booked under. After getting thousands of emails, Jordan Axani actually found 18 Elizabeth Gallaghers with a Canadian passport. A Nova Scotia woman accepted his offer. Flexible Subscription Packages ranging from three passes to seven passes go on sale Feb. 12, starting at $95. Individual tickets go on sale April 2. Through ATF’s 'Subscribe It Forward' program, last year’s subscribers who choose to renew will get the gift of a free additional subscription to give to any friend who was not a subscriber to the previous season. Packages and tickets to individual shows may be purchased by calling 518-480-4878 or visiting the Wood Theater Box Office. For more information on the full season, including detailed show descriptions and video trailers, visit www.ATFestival.org. In this romantic comedy musical, a young man, Marc, plans a honeymoon adventure around the world only to have his fiancé break up with him. Alone, with non-transferable and non-refundable plane tickets, Marc searches social media to find someone with the exact same name as his ex to travel the globe with him. Next up is “The Enlightenment of Percival von Schmootz,” a musical comedy, that Rabinovitz said is like Monty Python meets the Dark Ages. Telling the story of von Schmootz, who lives in a town called Manureshire and is the only person who washes his hands, the play takes the audience on his disastrous journey. Fed-up with plagues, pestilence and poor personal hygiene, von Schmootz searches to find the light and end the Dark Ages. Playing in its early development to Canadian audiences, “Sequence” has already won a host of awards: the Woodward/Newman Drama Award; Betty Mitchell Award Winner for Outstanding New Play; Calgary Theatre Critics Award, Best New Script; Grand Prize winner, Alberta Playwriting Competition; STAGE International Script Competition, finalist; and Gwen Pharis Ringwood Award for Drama. “Sequence” follows Time Magazine’s “Luckiest Man Alive,” who has successfully bet double or nothing on the Super Bowl coin toss for 20 consecutive years. He’s getting ready to risk $800 million on his twenty-first try when a young woman claims to have figured out his mathematical secret. In a parallel story, a blind genetics professor think’s she has found the luck gene in someone unlucky. In “Beau,” eight actor-musicians tell the story of Ace Baker, who at 12 discovers his grandfather is still alive and learns about life through music and a guitar. Season subscriptions go on sale next week. Join us in celebrating ATF’s 25th Anniversary with a look back at the theatre’s most memorable musicals! Revisit your favorite men in Guys on Ice and Altar Boyz, your favorite sea creatures in Mimi Le Duck and Loch Ness, and all of your favorite explosions in Tick, Tick…BOOM and Bomb-itty of Errors. You’ll be tapping your toes to Heartbeats and Nikola Tesla Drops the Beat at ATF’S GREATEST HITS, an evening we promise will be Uncivil… and unforgettable.